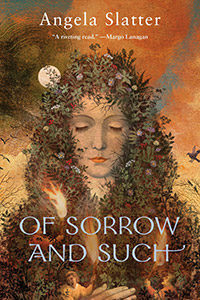 Well, a year since its release and my lovely Ditmar Award winning Tor.com novella, Of Sorrow and Such keeps getting nice reviews. Huzzah! Thanks, Alasdair Stuart. Mistress Gideon is a witch. The people of Eddas Meadow, the village where she lives, either don’t care or choose not to see it. Mistress Gideon is simply the woman who heals them, who helps them, who greases the wheels of the village’s quiet little society. Until one night, a woman visits Mistress Gideon. Her visitor is bleeding to death. Her visitor shares Mistress Gideon’s secret. And her visitor is bringing chaos with her. To save a life is to take responsibility for every future action in that life. But what if the person you save is dangerous? Slatter’s work moves with the same quiet, confident awareness as her lead character. Eddas Meadow is sketched out for us in the first few pages with a combination of affection and sarcasm that neatly defines the tone for the rest of the novella. Mistress Gideon lives in the village but she’s not of the village and she can see everything the other residents choose not to. That gives her emotional distance if not physical and it also means she can see the village, and by extension society, for what it is; a polite lie we all tell ourselves to keep the peace. It’s a remarkable, contemporary approach to fantasy that sidesteps any romanticism and makes the book instantly immediate, relatable and real. This entry was posted in fairy tales, News and tagged angela carter, angela slatter, fairy tales, margo lanagan, marina warner, Of Sorrow and Such, sourdough and other tales, the bitterwood bible and other recountings, the tallow-wife and other tales, tor.com. Bookmark the permalink.